nformation reaching the New Statesman indicates that Ghana’s only oil refinery, The Tema Oil Refinery (TOR), has virtually collapsed under the tenure of the ruling National Democratic Congress administration. Since NDC government took over the reins of government in 2009, TOR has been virtually dormant except in 2010 when the company operated continuously on the back of regular crude oil supplied by the Ghana National Petroleum Company under a 1-year ‘processing’ or ‘tolling’agreement. However, since then, TOR’s plants have been operating at less than 30% of capacity in 2009, 2011 and 2012. TOR’s virtual collapse has resulted in continuous year after year financial losses, massive brain drain of technical staff coupled with low morale and motivation among current TOR staff and management. The New Statesman can confirm that the NDC government has pursued policies designed to ‘kill’ TOR – by promoting over 12 new private fuel importers, while denying tor the working capital it needs. At the same time, the NDC government has refused outright to supply jubilee crude oil to TOR, with the baseless excuse that jubilee crude is not suitable for TOR. Meanwhile TOR’s assay tests have confirmed that TOR can easily handle and refine jubilee crude. In this edition, the New Statesman will assess TOR’s current situation and the NDC’s failed promises regarding the revival of TOR. Expensive spare parts ordered and delivered to the Tema ports since 2009 have not been cleared and have been left to the mercy of the weather. Technical personnel with years of experience, who are critical to the operations of the refinery, have also left for Qatar, Cameroon, Equitorial Guinea, Dubai and Abu Dhabi. The New Statesman can confirm that over 20 key engineers and technicians left TOR since 2011. It is being reported that TOR’s board and management have now resorted to offering“bribes” to some key staff not to decamp to the Middle East refineries. As though this was not enough, the government-to-government (g-to-g) crude oil agreement whereby the Nigerian National Petroleum Corporation (NNPC) supplies crude oil to TOR under concessionary terms has been in limbo since beginning 2011, as is the agreement with Equitorial guinea. TOR has not issued audited accounts since 2008. Without proper financial accounts and a clear turnaround plan, TOR’s bankers are unable to provide working capital for tor’s sustained operations. These problems have reduced TOR to a fuel storage depot where private importers store their fuel in return for a modest fee. These storage fees have become TOR’s only stable source of cash. As a result TOR is unable to meet salaries and other statutory payments, including payments to SSNIT, IRS and staff provident funds. The Mills/Mahama/Amissah Arthur government have not given adequate financial support to TOR. In 2010, the Ministry of Finance and Economic Planning paid a total of GH¢1.4 billion to Ghana Commercial Bank on TOR’s behalf. This was only a part of TOR’s debt, leaving a balance of about GH¢400 million payable to other creditors. Beyond the payments to Ghana Commercial Bank, the NDC government has only given promises to TOR, but has not provided any additional funds. In August 2011, then vice President John Mahama announced that the government of Ghana would provide $56 million to TOR immediately for retooling to improve its efficiency and performance. In addition, the Minister of Finance, Dr. Kwabena Duffour, stated at the same meeting, that the TOR debt recovery levy had accumulated GH¢270 million as of August, 2011 which would be used as collateral to raise $200 million working capital for TOR. As at today, 9th November 2012, the NDC government has failed to keep any of the above promises. Instead of taking bold and speedy actions to save tor, the NDC government continues to ‘dilly dally’, by launching endless consulting studies to find out how to save TOR. Just Explain It: What is the Strategic Petroleum Reserve? Eliminating America's dependency on foreign oil has been a policy goal for at least the last two U.S. Presidents. According to the International Energy Agency, by 2020, the U.S. will overtake Saudi Arabia as the world's number one oil producer. However, there's still some work to do. The United States Energy Information Administration reported that 45% of the petroleum consumed by the U.S. in 2011 was from foreign countries. Even though the country is well on its way to becoming self reliant, there's always a chance we could hit a major bump in the road. The good thing is we have protection. It's called the Strategic Petroleum Reserve or S.P.R. The reserve was created after the 1973 energy crisis when an Arab oil embargo halted exports to the United States. As a result, fuel shortages caused disruptions in the U.S. economy. The reserves are located underground in four man-made salt domes in Texas and Louisiana. All four locations combined hold a total of 727 million barrels of oil. 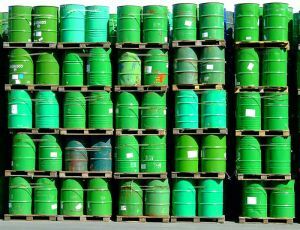 The inventory is currently at 695 million barrels. That's around 80 days of import protection. It's the largest emergency oil supply in the world -- it's worth about $63 billion. Only the President has the ability to tap the reserves in case of severe energy supply interruption. It's happened three times. Twice within the last decade. In 2005, President Bush ordered the emergency sale of 11 million barrels when Hurricane Katrina shutdown 25 percent of domestic production. In 2011, President Obama ordered the release of 30 million barrels to help offset disruptions caused by political upheaval in the Middle East. Following the release order, the reserve issues a notice of sale to solicit competitive offers. In the most recent sale involving the Obama administration, the offers resulted in contracts with 15 companies for delivery of 30.6 million barrels of oil. To put that in context, last year the U.S. consumed almost seven billion barrels of oil — that's 19 million per day -- or about 22% of the world's consumption. The release in 2011 had little effect on the price of gas at the pump. Consumers paid about 2% less for a week before the prices began to climb again. SCRANTON, Pa. (AP) — If the trash truck or bus rolling down your street seems a little quieter these days, you're not imagining things. It's probably running on natural gas. Surging gas production has led the drilling industry to seek out new markets for its product, and energy companies, increasingly, are setting their sights on the transportation sector. Touting natural gas as a cheaper, cleaner-burning alternative to gasoline and diesel, drillers, public utilities and government officials are trying to boost demand for natural gas buses, taxis, shuttles, delivery trucks and heavy-duty work vehicles of all sorts, while simultaneously encouraging development of the fueling infrastructure that will be needed to keep them running. The economics are compelling. Natural gas costs about $1.50 to $2 per gallon equivalent less than gasoline and diesel. That can add up to tens of thousands of dollars in savings for vehicles that guzzle the most fuel. Fleet managers are taking notice. Companies as diverse as AT&T, Waste Management and UPS are converting all or parts of their fleets to natural gas, as are transit agencies, municipalities and state governments. "Now that you can save a dollar or two dollars a gallon, there's huge interest in the market, especially in those fleets that use a lot of fuel," said Richard Kolodziej, president of the trade group Natural Gas Vehicles for America. 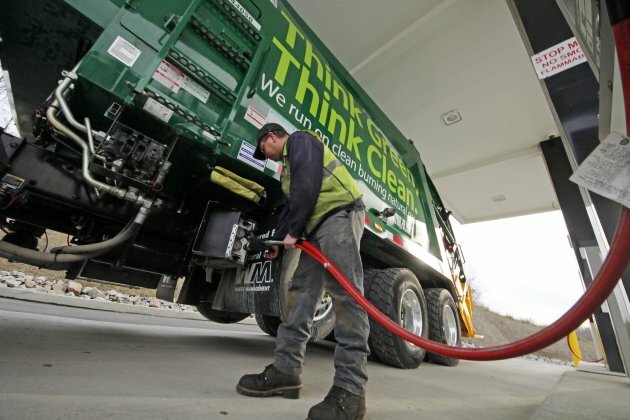 Waste Management, the nation's largest trash hauler, has committed to replacing 80 percent of its fleet with trucks powered by natural gas. Rich Mogan, the company's district manager in southwestern Pennsylvania, said about half of his fleet of 100 trucks now run on the cheaper fuel. They are quieter and less expensive to maintain, he said, and "we are looking at a 50 percent reduction in our (fuel) cost." Driller EQT Corp. opened its own natural gas filling station outside Pittsburgh in summer 2011, using it to refuel its trucks while also making it available to the public. It's now doing about 1,000 fill-ups a month — and only half involve EQT vehicles. Other users include City of Pittsburgh trash trucks, shuttles run by the University of Pittsburgh Medical Center, a taxi service and a handful of consumers. EQT wasn't sure how the station would be received. "We didn't have commitments at all beyond our own vehicles. It was really a guess of what we think we could do," said David Ross, an EQT vice president focused on market development. "We had people who, at the beginning, said, 'No, we're not interested.' Today they actually own a vehicle that's natural gas. I think having the physical asset sitting there has helped it become real for people." Natural gas vehicles aren't new. But the drilling boom — spurred by new technology that unlocked vast reserves of natural gas in deep rock formations like the Marcellus Shale underneath parts of New York, Pennsylvania, West Virginia and Ohio — created a gas glut that depressed prices. That, in turn, has made natural gas more attractive as a transportation fuel. Partly because of a lack of fueling infrastructure, gas isn't expected to grab significant market share from petroleum anytime soon. Only a tenth of 1 percent of the natural gas consumed in the Unites States last year was used as vehicle fuel, according to the U.S. Department of Energy. Of more than 250 million vehicles on the road today, perhaps 125,000 are powered by natural gas. But energy companies see potential. Chesapeake Energy Corp., the nation's No. 2 producer, has been especially aggressive about targeting transportation. The Oklahoma City-based driller invested $150 million in Clean Energy, a company backed by Texas investor T. Boone Pickens that's building a nationwide network of liquefied natural gas refueling stations for long-haul truckers. Chesapeake also teamed up with General Electric on "CNG In A Box," a compressed natural gas fueling system for retailers; announced a partnership with GE and Whirlpool to develop a $500 appliance that would allow consumers to refuel their natural gas-powered cars at home; and has been working with 3M to design less expensive tanks. "It's simply a matter of time before the U.S. meaningfully shifts from transportation systems built around consuming high-priced oil to consuming low-priced domestic natural gas," Chesapeake CEO Aubrey McClendon wrote to investors this year. States are also promoting natural gas as a transportation fuel. Nearly two dozen state governments have formed a consortium to add natural gas-powered vehicles to their fleets, an effort launched by the governors of Oklahoma and Colorado that attracted more than 100 bids from dealerships last month. Separately, the Pennsylvania Department of Environmental Protection is dangling $20 million worth of incentives to goose the market for medium- and heavy-duty natural gas vehicles. The three-year program, which launches Dec. 1 and is funded by a state fee on drillers, aims at putting 600 to 700 new natural gas-powered trucks and buses on the road in its first year. State officials also hope to use the grant program to spur a network of new filling stations. Pennsylvania has only 14 publicly available stations, and more places to fill up could help stoke consumer demand. "The big prize here is to get consumers purchasing vehicles that run off natural gas," said Geoff Bristow of the Pennsylvania DEP. Industry officials, though, acknowledge that's a long way off. Conventional gasoline engines are becoming more efficient, and consumers might balk at spending more on a natural gas-powered car. Plus, the United States has less than 600 natural gas filling stations available to the public, compared with 160,000 gas stations. The only factory-made, natural gas-powered passenger car available to U.S. consumers is the Honda Civic Natural Gas. While Honda expects sales to top 2,000 this year, that's a fraction of the number of gasoline-powered Civics it moves in a single month. Analyst Mike Omotoso of research firm LMC Automotive sees natural gas as a niche transportation fuel. "There is very little interest in natural gas for cars," Omotoso said. "People looking for alternatives are looking at hybrids and electric vehicles." For now, the gas industry is concentrating on heavy trucks and buses, vehicles that ply a regular route and return to the same base to fill up. But both Kolodziej and Norman Herrera, Chesapeake's director of market development, see a future where natural gas-powered cars and SUVs are commonplace and "you have a market like transit and trash, where all the pieces are in place and all the bottlenecks have been resolved," Herrera said. 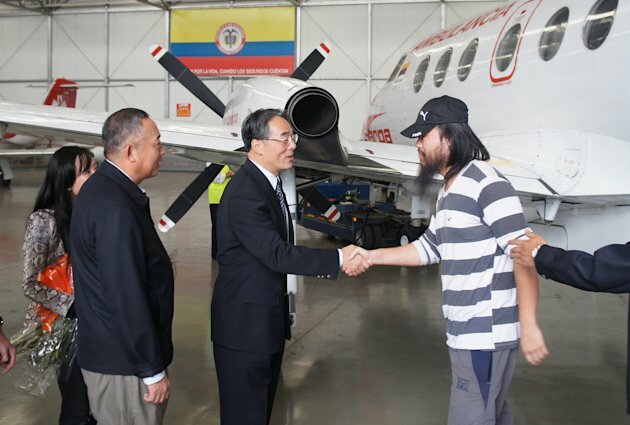 BOGOTA, Colombia (AP) — Four Chinese oil workers have been freed in the same southern jungles where the country's largest rebel group kidnapped them 17 months ago, police said Thursday. China's ambassador said that no ransom was ever sought for the men. The four Chinese nationals, three contractors and a translator, were the only foreigners known to still be held by the Revolutionary Armed Forces of Colombia, or FARC. Their release around midnight Wednesday to the International Red Cross comes three days after the FARC and Colombia's government began peace talks in Cuba that were partially conditioned on the rebels halting extortive kidnapping. It led Colombia's defense minister to call them "mendacious and traitorous" Thursday for having claimed in September to no longer hold kidnap victims. The rebels announced in February that they were halting all kidnapping and they insist they hold no more captives, neither "political prisoners" nor "economic" hostages. The FARC has been fighting successive Colombian governments for a half century and has used kidnapping for political leverage and as a financing source, at one point holding three U.S. military contractors as well as several dozen prominent Colombian politicians. Asked whether a ransom was paid for the men's release, Chinese Ambassador Wang Xiaoyuan told reporters in Bogota that "a ransom was not even demanded." He said no one ever claimed responsibility for the kidnapping. He did not explain how the men's release was accomplished. State police chief Col. Carlos Vargas said the four were released in good shape in a rural area of San Vicente del Caguan, a FARC bastion. The country chief of the International Committee of the Red Cross, Jordi Raich, told reporters the four were freed by a small group of unarmed men in civilian clothing. He said the freed oil workers all appeared in good health though one appeared to have difficulty walking and would surely be given a medical checkup. Employed by the British company Emerald Energy, which is part of the China-based Sinochem Group, they were seized June 8, 2011, while engaged in oil exploration work. The men's driver, who was released with their vehicle, said they were taken by at least seven FARC rebels. Authorities identified the freed men as Tang Guofu, 28, Zhao Hongwei, 36, Jian Mingfu, 46, and Jiang Shan, 24. They said Jiang was the translator. The men were flown to Bogota on a plane chartered by the Chinese Embassy. Ambassador Wang said they would fly home to China on Friday. Wang has said the embassy had never received any proof-of-life evidence for the four men and that neither their relatives nor the company had contact with them. The FARC said in early September, when it and the government announced the beginning of formal peace talks, that it no longer held any kidnap victims. Yet the citizen's group Pais Libre, which tracks kidnap victims, claims the rebels have kidnapped at least a dozen people this year and that dozens more abducted in previous years remain unaccounted for. Defense Minister Juan Carlos Pinzon took the opportunity to accuse the FARC of being "a mendacious and traitorous organization" that "lies to the country and the international community. "We have already become accustomed to hearing a lie every time they pick up a microphone," he told a gathering Thursday at a police operations center in Tolima state, according to the ministry's website. Pinzon used equally harsh rhetoric Monday in reacting to the FARC's announcement of a unilateral two-month cease-fire that began the following day. Associated Press writers Vivian Sequera in Bogota and Frank Bajak in Lima, Peru, contributed to this report. 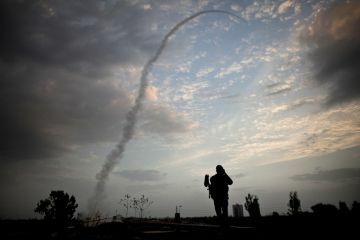 Crude oil options volatility declined with the underlying futures after Hamas said a draft accord for a cease-fire that would end fighting between Israeland Palestinian groups in the Gaza Strip is almost ready. Implied volatility for at-the-money options expiring in January, a measure of expected price swings in futures and a gauge of options prices, was 27.95 as of 4:20 p.m. on the New York Mercantile Exchange, down from 28.91 yesterday. Crude oil for January delivery declined $2.53 to $86.75 a barrel on the Nymex, the biggest decrease since Nov. 7. The contract surged to $89.28 yesterday, the highest settlement price since Oct. 19. The conflict in Gaza threatens further instability in theMiddle East and North Africa after a wave of uprisings since Last year, including one in Libya that almost entirely cut the nation’s crude exports. The region accounted for 36 percent of global oil output and held 52 percent of proved reserves in 2011, according to BP Plc (BP)’s Statistical Review of World Energy. The most active options in electronic trading today were January $80 puts, which gained 13 cents to 42 cents a barrel on volume of 4,635 lots at 4:59 p.m. January $95 calls were the second-most active, with 2,489 lots exchanged as they fell 45 cents to 39 cents a barrel. Bets that prices would rise, or calls, accounted for 49 percent of the 52,235 lots traded. The exchange distributes real-time data for electronic trading and releases information the next business day on open-outcry volume, where the bulk of options activity occurs. In the previous session, bullish bets made up 58 percent of the 192,293. January $105 calls were the most actively traded options yesterday with 19,279 contracts. They rose 3 cents to 21 cents a barrel. January $102 calls rose 4 cents to 28 cents on volume of 16,812. Open interest was highest for January $105 calls, with 53,858 contracts. Next were January $110 calls with 38,540 lots and January $60 puts with 34,935. Ghana’s export trade recorded an annual growth of 3% in the first three quarters of 2012. The country registered a value of $10.1 billion in terms of the total merchandises exported during the period compared to $9.8 billion in the same period of 2011, according to the Bank of Ghana (BoG). Ghana exported $4.1 billion worth of gold, $1.9 billion cocoa beans and $2.1 billion crude oil, the during 2012, the central bank said. It noted that other exports amounted to $2 billion. Despite the growth rate in exports, Ghana’s import rate continues to rise therefore widening the country’s trade deficit. The BoG noted that the country’s total merchandise imports amounted to $13.2 billion for the first three quarters of 2012 compared with $11.5 billion in the same period of 2011. “Crude oil imports amounted to $681.9 million while imports of refined oil products were $1.7 billion. Gas imports through the West African Gas Pipeline amounted to $128.7 million,” the BoG said in a Monetary Policy Committee (MPC) press release November 14, 2012. Total non-oil imports, the release said, grew by 15.1% to $10.7 billion in the three quarters of 2012. Of this, the BoG indicated that capital imports were estimated at $2.4 billion (22% of total imports), intermediate imports amounted to $5.2 billion (48.3%), consumption imports, $2.4 billion (22%) and other imports $873.4 million. BoG data shows that from January to September 2012, the current account deficit was $4 billion, as against $1.7 billion recorded in the same period of 2011. This outturn was mainly attributed to a trade deficit of $3.2 billion, a net services and income outflows of $2.7 billion, and a net inflow from transfers of $1.8 billion during the period, it added. The data further stated that the capital and financial account improved to $1.6 billion in the first three quarters of 2012, compared with $1.3 billion in the same period of 2011. “This was accounted for by increased net portfolio investments and Foreign Direct Investments,” the BoG observed. The overall balance of payments, according to the central bank, resulted in a deficit of $2.3 billion during the period, compared to a deficit of $288 million for the corresponding period of 2011. LONDON, (Reuters) - OPEC acknowledged for the first time on Thursday that technology for extracting oil and gas from shale is changing the global supply picture significantly, and said demand for crude will rise more slowly than it had previously expected. In its annual World Oil Outlook, OPEC cut its forecast of global oil demand to 2016 due to economic weakness and also increased its forecast of supplies from countries outside the 12-nation exporters' group. "Given recent significant increases in North American shale oil and shale gas production, it is now clear that these resources might play an increasingly important role in non-OPEC medium- and long-term supply prospects," the Organization of the Petroleum Exporting Countries said in the report. OPEC has been slower than some to acknowledge the impact that new technologies such as hydraulic fracturing - known as "fracking" - may have on supply. Conoco's Chief Executive Ryan Lance has gone so far as to predict North America could become self-sufficient in oil and gas by 2025. In OPEC's new forecast, shale oil will contribute 2 million barrels per day (bpd) to supply by 2020 and 3 million bpd by 2035. For comparison, 2 million bpd is equal to the current output of OPEC member Nigeria, which is Africa's top exporter. Fracking involves pumping chemical-laced water and sand into a well to open cracks that release oil and gas. The technology has transformed the production outlook in North America but drawn criticism from environmentalists, although the industry insists it is safe as long as wells are properly built. OPEC said that in the medium-term shale oil would continue to come from North America only, but other parts of the world might make "modest contributions" in the longer term. Previous editions of the report saw no significant supply addition from shale oil. As recently as June, oil ministers including Rafael Ramirez of Venezuela played down its prospects as OPEC met in Vienna for its last meeting to set output policy. However, Thursday's report shows that the world is expected to need less oil from OPEC members, which pump more than a third of the world's oil and hold about 80 percent of its conventional crude reserves. That is partly because of a reduced demand outlook, reflecting immediate concerns about the strength of economic growth particularly in the euro zone and, over the longer term, higher oil prices. OPEC forecast world demand would reach 92.9 million bpd by 2016, a cut of over 1 million from last year's report. By 2035, consumption will hit 107.3 million bpd, more than 2 million less than previously thought. Demand was 87.8 million bpd in 2011. Partly due to the higher amounts of shale oil, supply from countries outside OPEC is expected to rise to 56.6 million bpd by 2016, up 4.2 million bpd from 2011. As a result, OPEC expects demand for its crude to average 29.70 million bpd in 2016, less than it is currently producing. The amount of crude needed from OPEC by 2015 is more than 1.6 million bpd less than it expected last year. "This downward revision, together with updated estimates of OPEC production capacity over the medium-term, implies that OPEC crude oil spare capacity is expected to rise beyond 5 million bpd as early as 2013/2014," OPEC said. OPEC assumes its preferred measure of oil prices OPEC-B-D will average $100 a barrel in the medium term, up from the $85-$95 during this decade that it assumed in last year's forecasts. It sees prices rising with inflation to $120 by 2025 and $155 by 2035, compared with $107 most recently. VENICE, La. An explosion and fire ripped through a Gulf oil platform Friday as workers used a cutting torch, killing two people, sending at least four others to a hospital with burns and leaving two more missing in waters off Louisiana. Kirk Trascher, a spokesman for rig owner Black Elk Energy, told CBS Houston affiliate KHOU-TV that two workers died in the incident. Black Elk is an independent oil and gas company headquartered in Houston. Petty Officer Carlos Vega, a Coast Guard spokesman, told CBS News that the two missing workers had jumped overboard. Coast Guard Capt. Ed Cubanski told a news conference in New Orleans the well was not producing at the time and no oil was leaking. A small amount of oil spilled from the rig when workers using a torch cut into a 75-foot-long, 3-inch-wide line on the platform. Cubanski said a sheen one-half mile long and 200 yards wide was reported in the area. "It's not going to be an uncontrolled discharge from everything we're getting right now," Cubanski said. Taslin Alfonzo, spokeswoman for West Jefferson Medical Center in suburban New Orleans, said four injured workers were brought to the hospital in critical condition with second- and third-degree burns over much of their bodies. Three arrived by helicopter at 9:55 a.m. and one by helicopter at 10:10 CST. Two were sent by ambulance to the Baton Rouge Burn Center. Two others were to be sent later. She could not release identities or any other information. The production platform is about 25 miles southeast of Grand Isle, La. The Coast Guard said 26 people were aboard the platform at the time of the explosion. The platform is for oil production from an established well, unlike the Deepwater Horizon rig, which was drilling an exploratory well for oil giant BP in mile-deep water when it blew up and triggered a massive oil spill in 2010. That site is well to the east of Friday's explosion. Cubanski said the platform appeared to be structurally sound. After the April 2010 explosion on the Deepwater Horizon, that rig burned for about 36 hours before suffering structural collapse and sinking to the Gulf floor. The Coast Guard got the call about the fire at 8:42 a.m. CST. Black Elk's website says it holds interests in properties in Texas and Louisiana waters, including 854 wells on 155 platforms. NEW ORLEANS — Oil giant BP has agreed to pay the largest criminal penalty in U.S. history, totaling billions of dollars, for the 2010 oil spill in the Gulf of Mexico, a person familiar with the deal said Thursday. The person, who spoke on condition of anonymity because they were not authorized to speak on the record about the deal, also said two BP PLC employees face manslaughter charges over the death of 11 people in the explosion of the Deepwater Horizon oil rig that triggered the massive spill. The person said BP will plead guilty to obstruction for lying to Congress about how much oil was pouring out of the ruptured well. The Deepwater Horizon rig, 50 miles off the Louisiana coast, sank after the April 20, 2010, explosion. The well on the sea floor spewed an estimated 206 million gallons of crude oil, soiling sensitive tidal estuaries and beaches, killing wildlife and shutting vast areas of the Gulf to commercial fishing. BP's environmentally-friendly image was tarnished, and independent gas station owners who fly the BP flag claimed they lost business from customers who were upset over the spill. BP chief executive Tony Hayward stepped down after the company's repeated gaffes, including his statement at the height of the crisis: "I'd like my life back." The cost of BP's spill far surpassed the Exxon Valdez spill in 1989. Exxon ultimately settled with the U.S. government for $1 billion, which would be about $1.8 billion today. The government and plaintiffs' attorneys also sued Transocean Ltd., the rig's owner, and cement contractor Halliburton, but a string of pretrial rulings by a federal judge undermined BP's legal strategy to pin blame on them. At the time of the explosion, the Deepwater Horizon was drilling into BP's Macondo well. The rig sank two days later. After several attempts failed, engineers finally were successful in capping the well on July 15, 2010, halting the flow of oil into the Gulf of Mexico after more than 85 days. administration dealt with a political headache, in part because the government grossly underestimated how much crude was spilling into the Gulf. U.S. District Judge Carl Barbier in New Orleans was assigned to oversee tens of thousands of court claims spawned by the explosion. A trial date was set, but Barbier postponed it so BP could hammer out a deal with attorneys for Gulf Coast shrimpers, commercial fishermen, charter captains, property owners, environmental groups, restaurants, hotels and others who claim they suffered economic losses after the spill. Relatives of workers killed in the blast also sued. Barbier gave his preliminary approval to that proposed settlement in May and scheduled a January trial for the remaining claims, including those by the federal government and Gulf states. In a pretrial court filing, the Justice Department said it would argue that BP's actions and decisions leading up to the deadly blowout amounted to gross negligence. "We do not use words like `gross negligence' and `willful misconduct' lightly," a Justice Department attorney wrote. "But the fact remains that people died, many suffered injuries to their livelihood, and the Gulf's complex ecosystem was harmed as a result of BP and Transocean's bad acts or omissions." One of Barbier's rulings possibly insulates Transocean and Halliburton from billions of dollars in liability. Barbier said Transocean and Halliburton weren't obligated to pay for many pollution claims because of contracts they signed with BP. The Justice Department opened a criminal investigation of the spill. The only person facing charges so far is former BP engineer Kurt Mix, who was arrested in Texas in April on obstruction of justice charges. Mix is accused of deleting text messages about the company's response to the spill, not what happened before the explosion. The companies also sued each other, although some of those cases were settled last year. 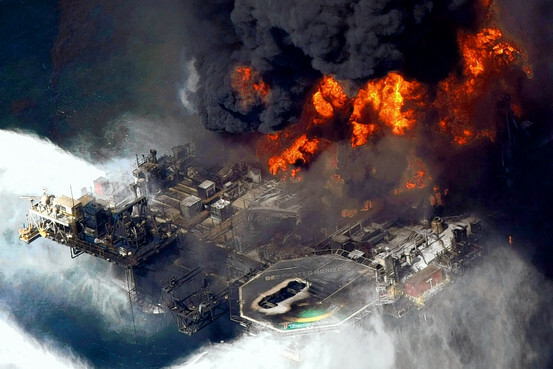 BP has sued Transocean for at least $40 billion in damages. And there are still other claims against BP from financial institutions, casinos and racetracks, insurance companies, local governments and losses caused by a government-imposed moratorium on drilling after the spill. None of those are covered by BP's proposed settlement with the private lawyers. In January 2011, a presidential commission found that the spill was caused by time-saving, cost-cutting decisions by BP, Halliburton and Transocean that created unacceptable risk. The panel didn't point blame at any one individual, concluding the mistakes were caused by systemic problems. Shell’s unit in Nigeria, Shell Petroleum Development Co. (SPDC), has closed its eighth sale in Nigeria of its Niger Delta assets. The company completed the assignment of its 30% interest in OML 30 to Shoreline Natural Resources Ltd.. Total cash proceeds for Shell amount to some $567 million. This divestment is part of SPDC’s onshore portfolio and is in line with Nigerian government’s aim of developing indigenous companies in the country’s upstream oil and gas business. OML 30 covers an area of some 1,097 sq km and includes the Kokori, Afiesere, Oweh, Olomore, Eriemu, Evwreni, Oroni and Isioka fields and related facilities. The divested infrastructure includes most of the Trans Forcados major crude oil pipeline from OML 30 to the Forcados River manifold. The remaining 8 km to the Forcados terminal will remain with the SPDC JV. The divested fields produced around 35,000 bpd of oil and condensate. Total E&P Nigeria (10%) and Nigerian Agip Oil Co. (5%) have also assigned their interests in the lease, ultimately giving Shoreline a 45% interest. SPDC is the operator of a JV between NNPC (55%), Shell (30%), Total E&P Nigeria (10%) and Nigerian Agip Oil Co. (5%). Shoreline Natural Resources Ltd. is a Nigerian JV company between Shoreline Power Company Ltd. and Heritage Oil Plc. ABUJA (Reuters) - Shell shut its Imo River oil pipeline in Nigeria on October 31 due to damage caused by thieves and deferred 25,000 barrels per day (bpd) of production, the company's local unit said on Sunday. This latest outage will add to a growing list of production problems for Africa's biggest oil exporter.Nigeria's worst flooding in 50 years contributed to Shell and Eni declaring force majeure on major crude oil grades in recent weeks. This means they cannot keep to contract agreements due to problems out of the company's control. U.S. oil major Exxon said on Saturday it had shut a pipeline off the coast of Nigeria's Akwa Ibom state after an oil leak but it didn't say what the cause of the spill was or how much output was affected. "(Shell) shut down the Imo River Trunkline in its eastern operations after it found several crude theft points on the facility," an emailed statement from Shell's Nigerian arm said. "Some six crude theft points have so far been confirmed on the 12-inch trunkline, of which three have been repaired." Shell said two crude oil theft valves had also been attached to its Trans-Niger Pipeline on Sunday but these had been closed off and the pipeline was being reopened. Oil spills are common in Nigeria's onshore Niger Delta due to widespread theft by oil gangs tapping into pipelines and the poor maintenance of some ageing infrastructure. Crude theft is a growing problem in Nigeria and oil companies estimate around 150,000 bpd is stolen. Some of it is made into fuel locally in makeshift refineries, hundreds of which are hidden in dense mangroves of the Delta. But much gets transported into international markets as part of criminal networks, oil industry sources say. Oil spills have a devastating environmental impact, destroying fishing communities and leaving large parts of the Niger Delta's winding waterways layered in a shiny black film. Shell said there had been 26 spills in the Imo River area so far this year alone, spilling 3,000 barrels of oil. Information reaching the New Statesman indicates that Ghana’s only oil refinery, The Tema Oil Refinery (TOR), has virtually collapsed under the tenure of the ruling National Democratic Congress administration.